The head of the Pentagon's F-35 office has confirmed that some 49% of the 280 planes delivered to the military by Lockheed Martin are suffering from a series of hardware and software problems. Vice Admiral Matt Winter, director of the F-35 Joint Program Office, has confirmed that just 51% the US new 5th-gen fighter aircraft are flight ready, with the initial production lots delivered starting in 2015 having a flight ready status as low as 40%. Later batches have improved availability rates, with the latest two lots averaging 70-75%, he added. According to the officer, the F-35's Autonomic Logistics Information System (ALIS), an onboard diagnostics tool bedeviled by false positives, has been a big part of the problem. "They take it off and it's not bad but they don't know that [so they] put it into the supply chain," he explained. Later, they "find out it's not bad and send it back." 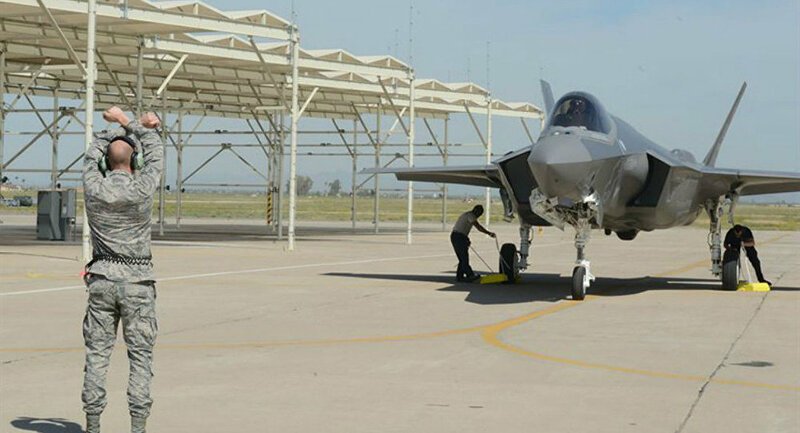 Spare parts, trained maintenance personnel, and a lack of tools necessary for maintenance are another issue, according to Winter, and lead to delays resulting in F-35s sitting on the runway or in their hangars instead of carrying out missions. "If you can afford to buy something, but you have to keep it in the parking lot because you can't afford to own and operate it, then it really doesn't do you much good," the officer said. Winter also complained about F-35 producer Lockheed Martin's pricing policy, stressing that the plane's $100 million price tag is way more than the Pentagon planned to spend going forward. "The cost ratio we're experiencing today, if it's the same cost ratio into the future as our fleet grows from 280 aircraft to the 800-plus that we'll have by the end of 2021, will be unaffordable, in that the services' budgets will not be able to sustain that," the officer said. Lockheed previously promised to reduce the price of F-35 A, the basic model for the Air Force, to $80 million by 2020. The Pentagon's budget for the 2019 fiscal year provides for the purchase of some 48 F-35A aircraft, the standard model for the Air Force, although the Air Force previously planned to acquire 60 jets per year. The F-35 Joint Strike Fighter program is the most expensive defense program in history, with a total program cost of $1.5 trillion, about $400 billion of that to be spent on the planes' acquisition, and the rest on maintenance and operations over a 50 year period. In addition to issues with price, the multipurpose aircraft have been plagued by reliability issues. Late last year, an F-35 reportedly began breaking up in mid-air in Okinawa during a routine training mission.